To start with, we are going to make a Quatre-Quarts loaf (pound cake). It is very popular in France and everybody knows how to make one. It is names 4/4 because the 4 major ingredients necessary are measured in exactly the same quantities. Method: start by melting the butter in the microwave for 1 minute, leave it to cool down. In the meantime whisk all 4 eggs whole, with sugar and the salt until there is no more granules. Now, add the melted butter and whisk again to mix. Sieve into the mix the flour and baking powder. Mix well, then add the vanilla essence and mix it in too. Now butter your loaf tin and pour in your cake mix. Place it in the oven for 40 minutes. Run your knife through the cake to check that it is dry inside. Once the cake is cooked, remove from the tin and place it on an oven tray to cool down for an hour. Then, cut the sides and the top bulge of the cake to make look rectangular. Cut the cake in the middle (the long way), cover both inside with Nutella chocolate. Place both side onto of each other like a sandwich and press down. Leave to the side. Time to prepare the chocolate covering. 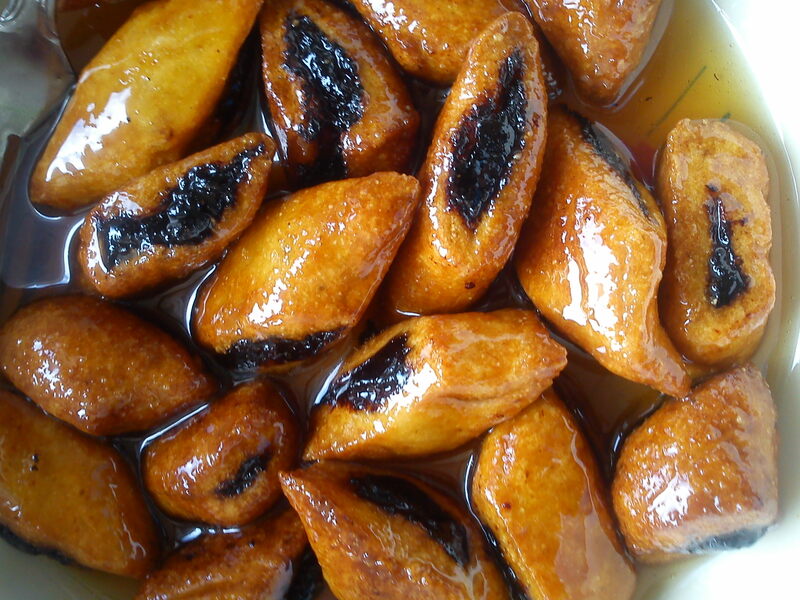 Heat the oil and the sugar together to melt all the granules… don’t let it brown, we just want to melt the sugar. Place all the dark chocolate in a bowl and then place the bowl in a shallow pot of boiling water. With a spatula, stir gently until all the chocolate is melted. Now add the still warm sugar and oil combo and mix well. Until is all look like a very shinny brown sauce. Switch off all fires. Now place your cake sandwich on a silver tray, then, gently pour your chocolate preparation on it making sure to cover all the visible areas of the cake. Leave it for 1 minute then, delicately dust the top of your cake with white chocolate flakes. I kept it simple as it was my first time playing around with this idea, but I suspect the next time, I will write something funny with the flakes. then place it in the fridge for 1 hour before serving. Serving suggestion – Happy Valentine! As the heat get at its best on this small island of ours here is something to cool you down! An orange sorbet… For 10 servings. Grate the lemon zest and press its juice. Set aside. 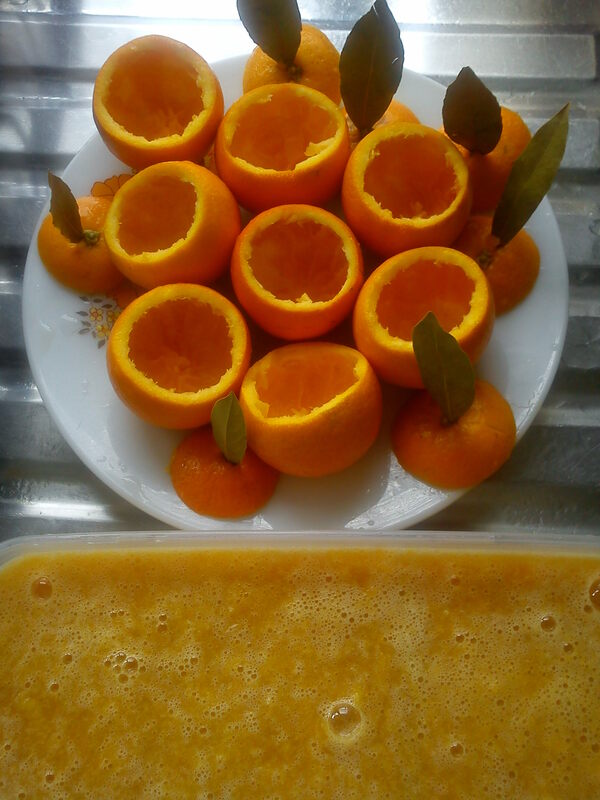 Cut the top of every orange and carefully carve the inside completely. Put all the pulp and juice collected in a bowl. Reserve the hollowed oranges and their “hats”. Make a little hole on the “hats” and insert 1bay leaf on each “hat”. Once this is done for all of them, put the “hats” and hollowed oranges coops in the freezer… they will later be used to serve the sorbets. With a hand blender, wiz the orange pulp to liquidise it completely. Set aside. Peel, core and finely chop the apples. Add it to the liquidised orange and blend again. In a deep pan put the sugar, the lemon juice and zest. Simmer for 20 minutes. 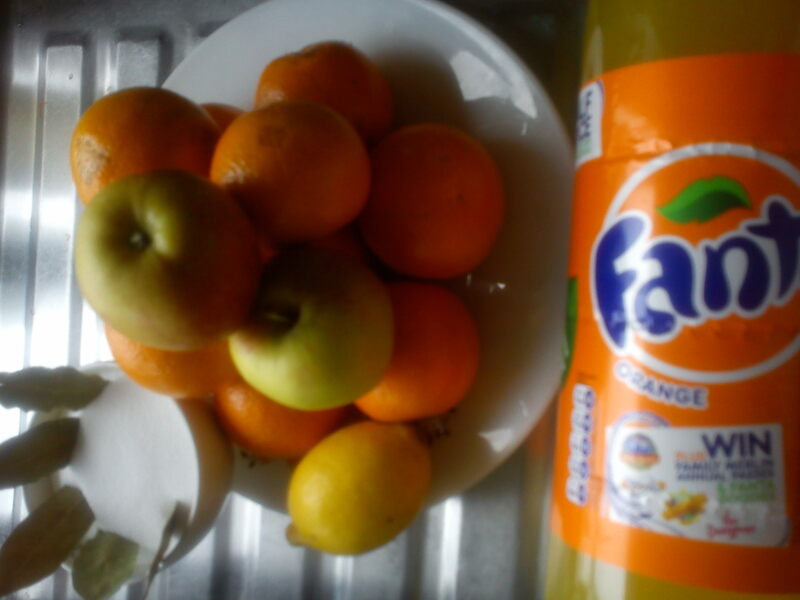 Remove from the stove, leave to cool for 10 minutes and add the liquidised orange & apple mix and the Fanta. With a spatula, stir to mix. Taste and add more sugar or lemon if it not sufficient to your taste. After the hour has passed, bring the bowl out of the freezer and with a folk or with the hand blender, break the granules of ice starting to form. Once it is smooth. Put the bowl back in the freezer. Repeat this every hour trice then your sorbet is ready to serve. Hazelnut, Walnut, Almond, sesame seeds, ground nut, palm oil. Hazelnut oil… The thing with this oil is that it always reminds me of a Starbucks coffee I used to love… If I am not careful, I will end up drinking this oil like wine… the taste of hazelnut is so strong, it is amazing. This is probably due to the quality of the oil. I got this one from Marks and Spencer’s. It is great for baking (used as a replacement for butter). ; It can also be used to drizzle on Salads if you are using chopped nuts and flash frying. Hazelnuts are apparently rich in vitamin B6, B and proteins… suppa duppa. I like that! Try it in your homemade pesto the next time… fry you pancakes with it… so yummy! Walnut oil. I was really surprised to find this one, again from Marks and spencer’s. The taste isn’t that strong and I rather use it in Salads. The taste of walnut is so light that and heating it might just lose it. So, I just use it raw and … sparingly. 250ml costs between £2.00 and £5.00 depending where you shop. It is worth having it handy. The bottle can last up to six months if you are being really economical with it. 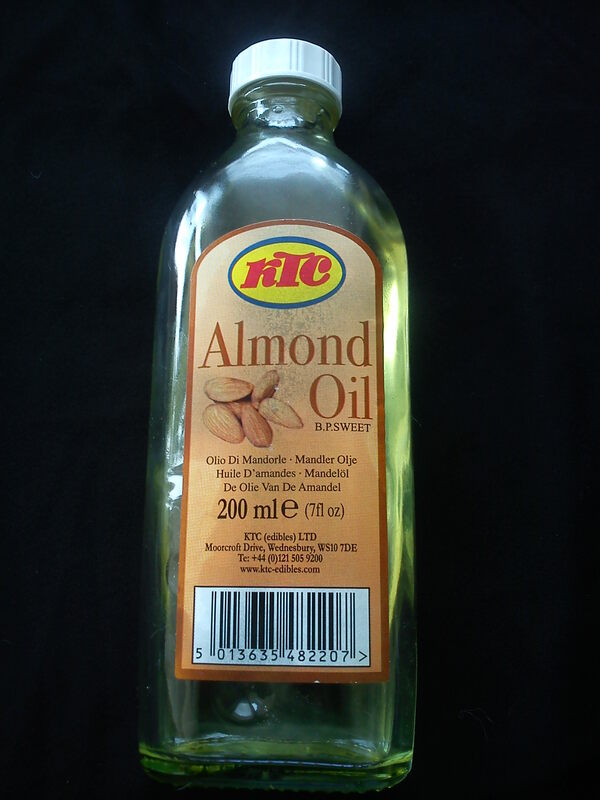 Almond oil. Growing up, I used this oil to moisturise. When I saw it on the food aisle it was a “ding” moment… I love almonds, but I was disappointed by the oil… I can’t taste the nuttiness in it. Not sure it really plays role in my collection of oils, but it is a worthy replacement for vegetable oil or rapeseed oil. It is not as expensive as the hazelnut or walnut oil, but, it is not available everywhere either. The Turkish shop and the Indian shop round the corner will have it in stock. 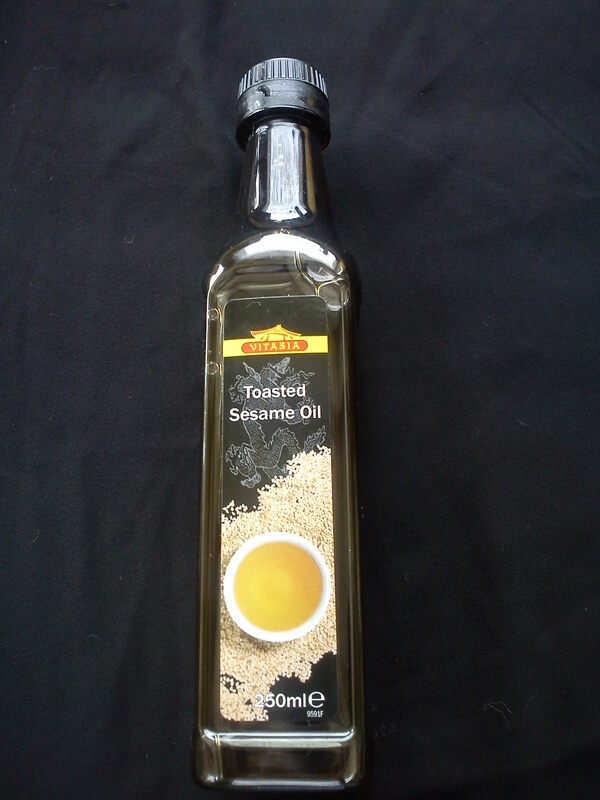 Toasted sesame oil. Now I love sesame, and if I could I would include it in all my baking and salads. But, for the sake of diversity…, I swap it for poppy seeds. Been a fan of this tiny little seed for ages. It was only natural that its oil should be included in my collection. The toasted sesame oil REALLY does tastes like TOASTED sesame… the taste is so strong, it would be a pity to heat it up for frying and lose all that taste. I recommend using it to finish off vegetable dishes and salads. It is widely used in south India, and I am sure that you have spotted it In the Japan centre in regent Street London. 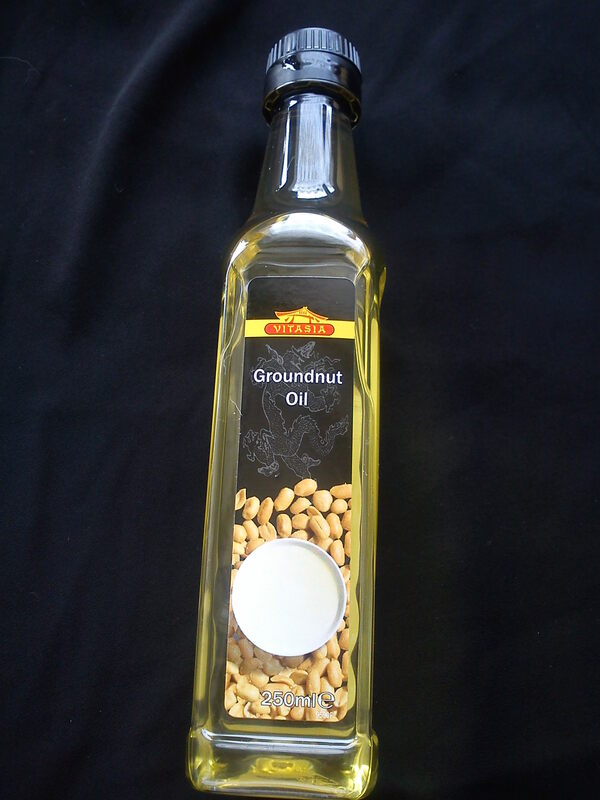 Ground nut oil. That is peanut oil or monkey nuts oil… not sure why this one has so many names… This oil is widely used in Asia and West Africa and is great for deep frying… Doughnuts and French fries. I bet this oil is much cheaper in Africa than it is here. I use it very sparingly in most cooking. I will not us it for deep frying because of its cost. It is apparently used as a biodiesel in some countries. It is a good one to have in the collection. 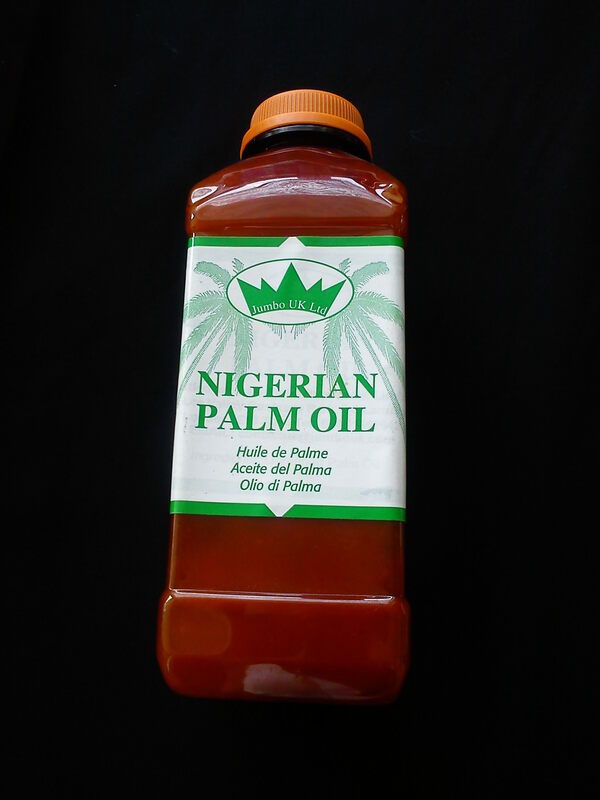 Palm Oil. Get this, you can find palm oil in Nutella and a lot of Palmolive products! Did you know that? I love the taste of this oil but, regular consumption of it isn’t recommended in this British climate which is very cold at times. This oil tends to coagulate very easily and is best suitable for really hot climates… Asia, south American and Africa. All those oils seem to be full of great things… how amazing. Just with this I might manage to stay away from my doctor for the next 12 months. 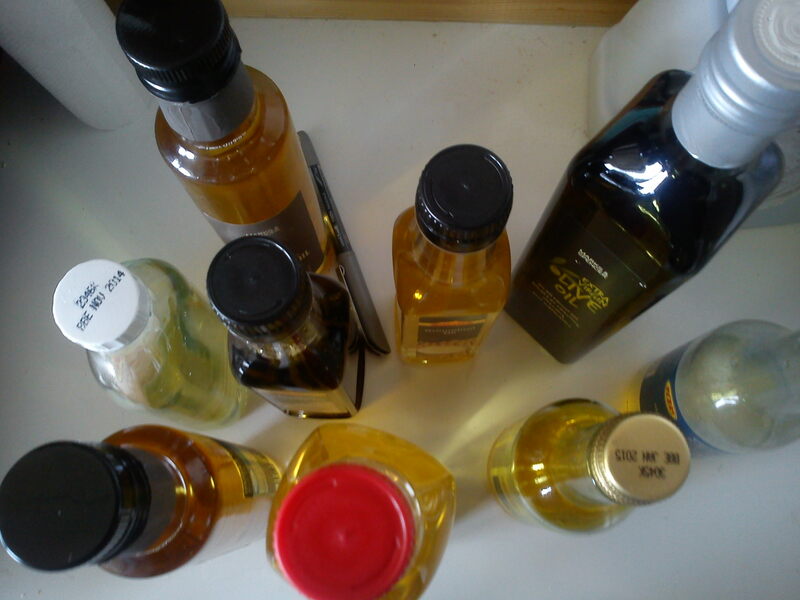 I really hope that you will try some of these oil. Do come back and let me know what you think. Hey do not try any of it if you are allergic to NUTS! Posted in Breakfasts & Brunches, Desserts, Main meals, Resto Reviews, Salads, Uncategorized. This is one of my preferred North Africa n treats. I love these things and since moving from France, I have learnt to make them… I no longer have my Algerian friends bringing me some during their Ramadan. I made these to show off at our office bake off. I didn’t win, but my British colleagues got to taste something different and only 1 makroute was left. I am actually really proud of them for trying it. I have used here ramekins to measure most things, but you can use a glass it is quicker than using scales (hater those) and saves space on the work top. Remove the stone in the dates and peel the skin if you are not fan… I couldn’t be bothered so kept the skin on. Cook them for 5 minutes in a microwave dish with 4 table spoons of water. Leave to cool then, mash with a fork. Dates are quite stringy so I recommend you use a hand blender to obtain a smooth paste. Scoop the paste out of the bowl and wrap in cling film. Leave aside. In a deep bowl, put the semolina, flour, milk, blossom water sugar and salt. Work the paste with your hands until obtaining a firm paste. Wrap into cling film and leave to rest for an hour with the date paste. After the hour cut the past in to 4 doughs and roll as if shaping a small baguette. 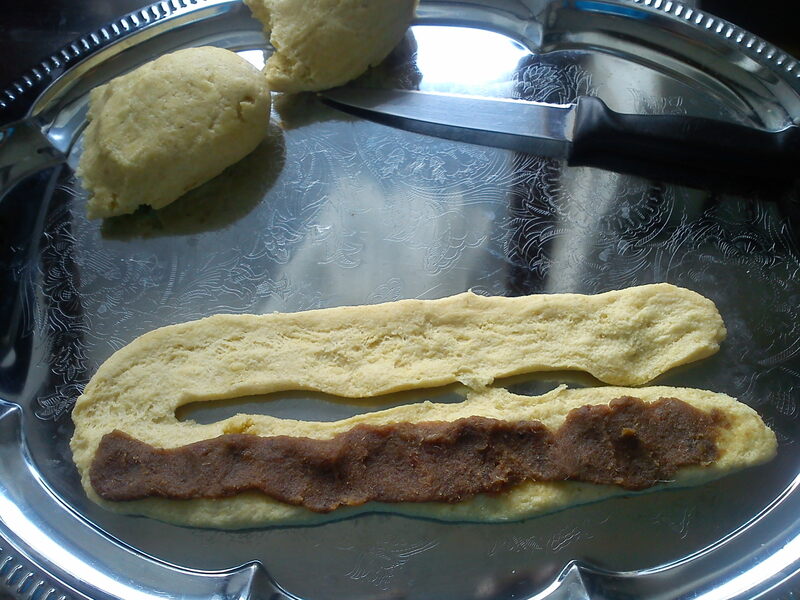 Now slice the baguette like shape in two; on one side, put some of the date paste, then cover completely holding in the date paste with no way to escape. Now, with a knife cut the “sandwich” in small lozenges. Repeat the last two operations until all the doughs are in lozenges. It would be ideal to fry them in a chip pan. If you do not have one, pour a litre of vegetable oil in a deep pan, leave it on the fire until the oil is really hot. Always put only 1 lozenge in the oil to see if it is hot enough. If you judge that the oil is hot enough, then fry about 15 lozenges at a time. It will take a bout 4 minutes to cook and brown. Remove from the oil and into the honey. Repeat the operation until it is all done. the more the makroutes absorb honey, the better. Now remove from the honey and put a grid to drain. It is all ready. Serve with a jasmine tea or vanilla ice cream. To make this beautiful dessert you will need: A 28cm tarte dish – 7 pears peeled and halved – A rolled shortcrust pastry – 200 grs of sugar 200grs of sugar – About 50grs of lemon zest. *Put half the butter and half the sugar in a pot and bring it to high heat until it caramelises. Add the halved pears, zest and salt. Cook until the caramel starts to stick to the pears. *Butter the cake dish generously. Then place the now caramelised halved pears on the dish face down. 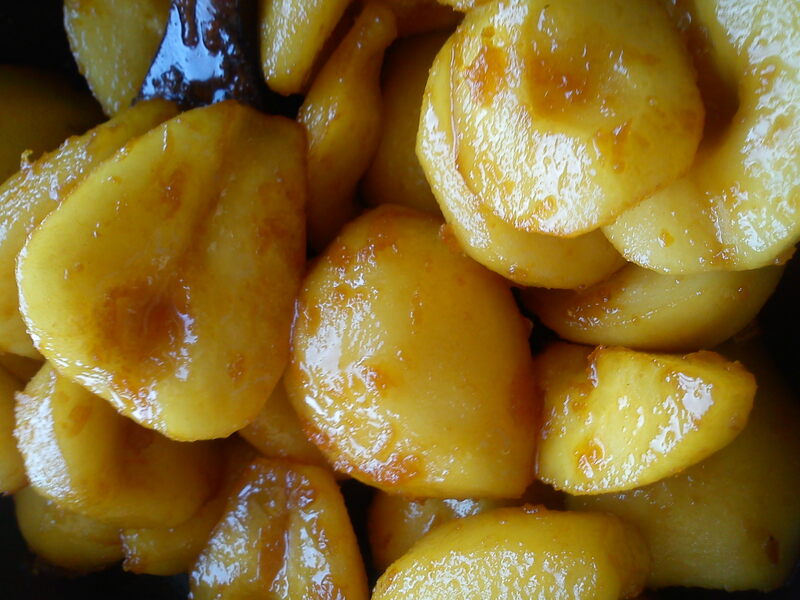 *Cut chunks of the remaining butter and place them on top of the pears in the dish. Now, add the remaining sugar evenly distributing it on the caramelised pear. 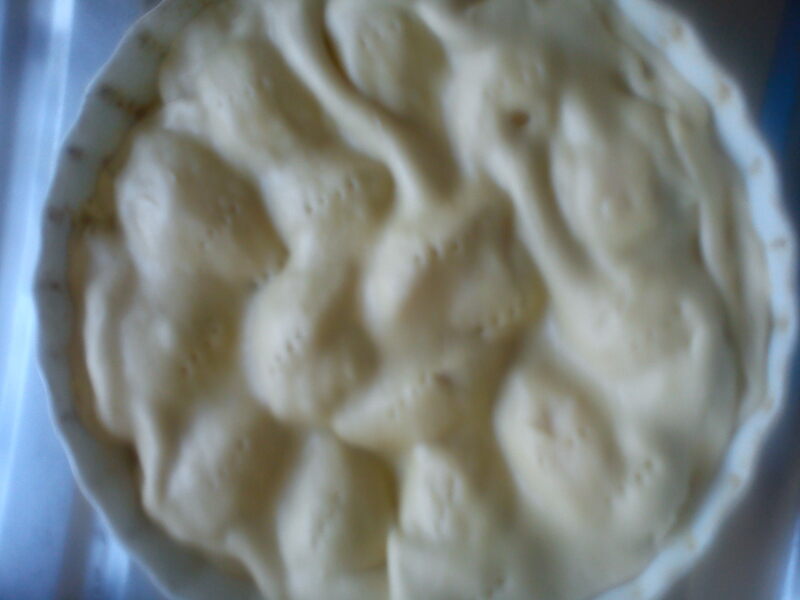 *Now unroll the shortcrust pastry on top of the dish, tuck in the sides completely covering and hugging in the pears. 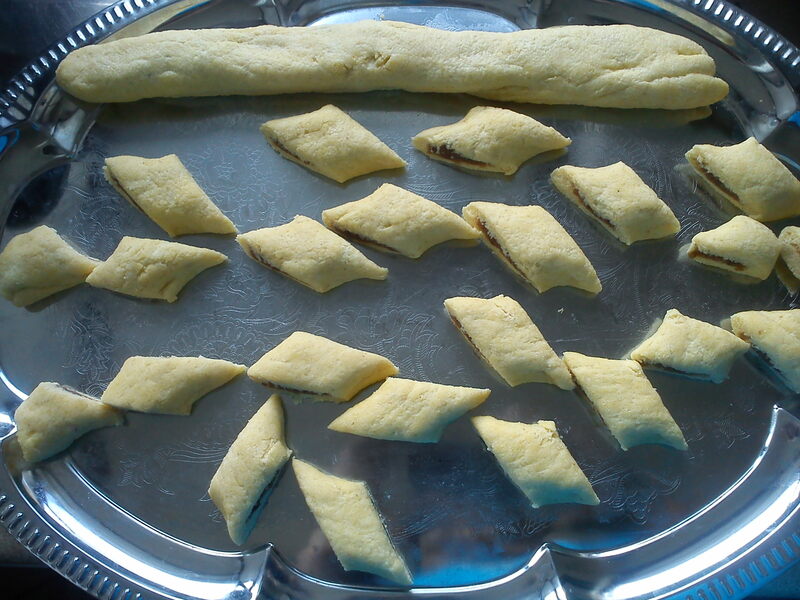 I only use ready rolled pastries because I do not have the space and frankly it saves time. *With a fork, prick the top of the paste so that it’ll let team while the tatin cooks. *Preheat the oven at 200c, then put your tatin in to cook for 45 minutes or, just follow the instructions on your paste wrapped. 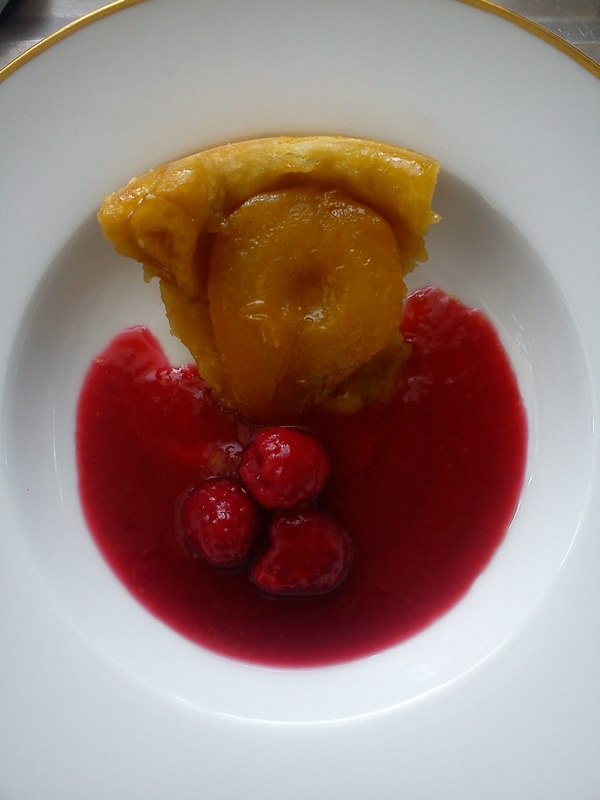 I like my pears really cooked and almost mushy, so I leave my tatin in the oven for longer.The pear can be replaced with apple. Not the cooking apples as they are too sharp. Look for the ones that look green and have like a rusty skin. They hold better when cooking. 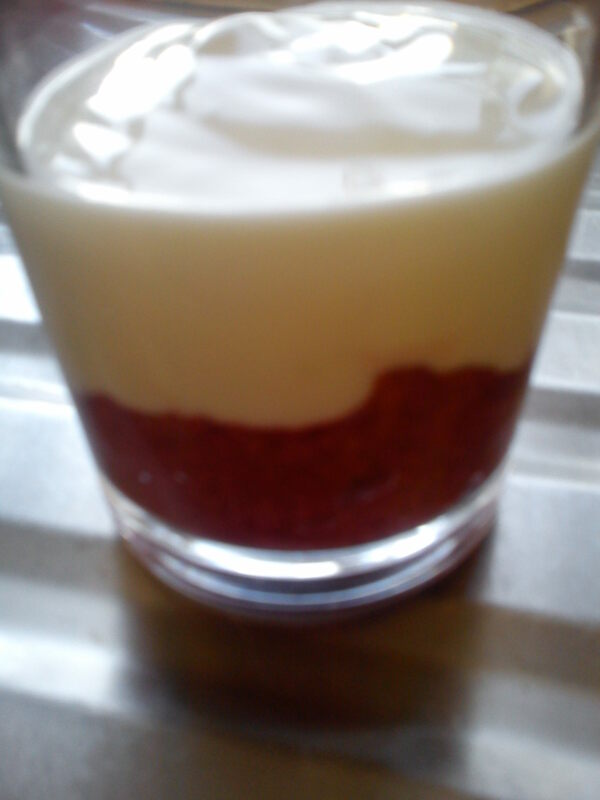 For the coulis: all you need is 700grs, 200grs of caster sugar, 100cl of water. 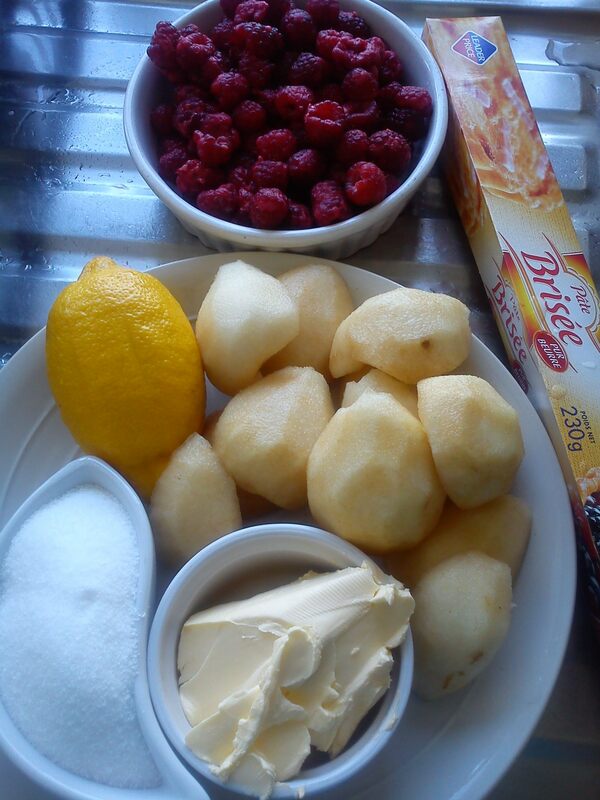 * Rinse the raspberries, add the caster sugar and water. 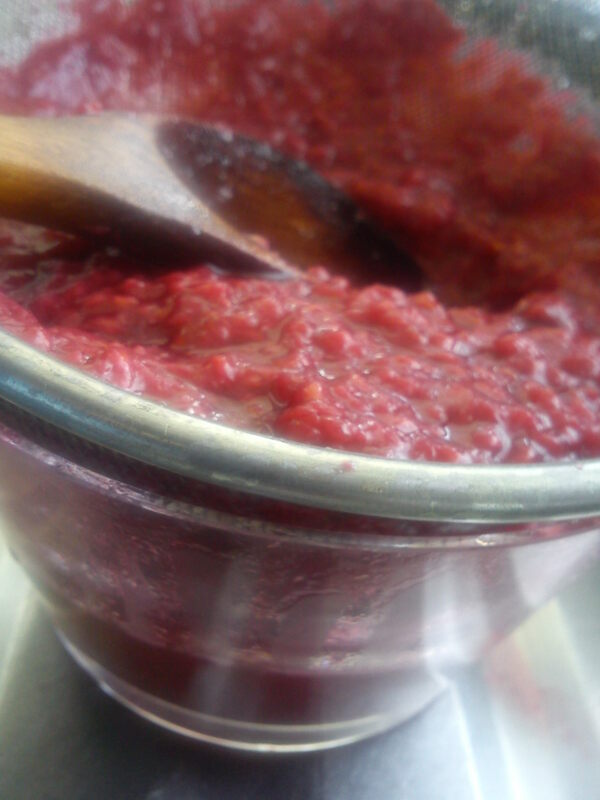 Bring to boil until the water dries out and only leaves mushy raspberries stewing. This should take about 20 minutes on high heat and stirring. * Remove from the fire and pass through a fine holed sieve pressing it with spatula until there is no more passing through the sieve. * Taste the coulis and adjust sugar as needed. Raspberries can be really sour and adding lemon isn’t a great idea in my opinion. Another use for the mush! yummy! sieve. It can be used as a base for another immediate dessert if you are baking something else right away. Or, you can just use it as a top up for natural yogurt or even milkshake. Even a basic ice cream could work. I am not one to waste food. Well, thank you for visiting the blog today. I am not sure yet how this is going to go, but will do my best to post at least once a month the dishes created on top of my kitchen sink. Yes my kitchen is so tiny and the best natural light is on top of the kitchen sink. That’s why most photos WILL feature my dear silver sink. I will try to feature meats, fishes, desserts, vegan and vegetarian dishes. I really hope that you will keep coming back for more and look forward to your comments too.